Richard Branson, founder of Virgin Galactic, in front of VSS Unity, one of the company's SpaceShipTwo vehicles. LAS CRUCES, N.M. — Virgin Galactic founder Richard Branson most likely won't be going to space in the next six months, despite his recent statement that he'd be "very disappointed" otherwise. Mike Moses, president of Virgin Galactic, said yesterday (Oct. 12) that while the company plans to have one of its SpaceShipTwo suborbital vehicles reach altitudes of more than 50 miles (80 kilometers) above Earth's surface within the next three months, it's unlikely that passengers — including Branson — will be on board in less than half a year. "Richard always poses a challenge. He likes to push very hard. Sometimes, I wish he wouldn't talk so much," Moses said, getting a laugh from the audience. "But three months is about right. We hope to be in space by the end of this year. He's a little bit further away [from a flight] than that." The SpaceShipTwo space plane will serve primarily as a tourism vehicle that will take customers on brief flights to altitudes of over 50 miles. It is carried to a height of about 50,000 feet (15,000 meters) by a large aircraft called WhiteKnightTwo. Branson has a history of publicly declaring ambitious timelines for the company. 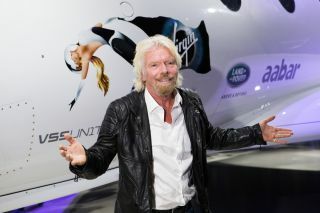 Virgin Galactic, together with the company Scaled Composites, began developing the tourism venture in 2004, with Branson originally estimating that the company would fly customers by 2007. The company's progress was further delayed in October 2014, when a SpaceShipTwo vehicle broke apart during a test flight, killing one pilot and seriously injuring another. In April, Branson said he would be disappointed if he did not get to take a trip aboard a SpaceShipTwo vehicle by the end of 2018, which is more in line with Moses' projection. The company CEO, George Whitesides, has also said the company should be flying tourists in 2018. Virgin Galactic has been conducting glide tests of a SpaceShipTwo vehicle named VSS Unity, meaning the vessel has flown while attached to WhiteKnightTwo but without an engine. Powered tests (with an engine) are expected to begin this year, Moses said. "We're going to do the powered program just like we did the glide program," Moses said. "The first thing you want to do is kind of predict what you're going to see, fly it, make sure you got what you thought so you know that your prediction for the step after that is right. We'll take our time with it. … We're going to fly when we're ready." Moses added that the company is currently building two additional SpaceShipTwo vehicles. He said Virgin Galactic has completed the fabrication of the two ship's cabin shells and will be putting the various systems (such as electrical) into the cabins next. "The skeletons of our next two spaceships are well on their way," Moses said. "The next step is to start assembling the wings and the fuselages and then bring those parts together. It's going to take a year to a year and a half for these vehicles to come online. … We really do want a fleet of spacecraft." Operating multiple spacecraft at the same time should allow Virgin Galactic to lower the price of a ticket for a suborbital flight, Moses said. The company has presold about 700 tickets at $250,000 each, but put a freeze on those sales last year, Moses said. "By having multiple ships, we can fly multiple times. It drops our overhead, and that really lets us open the market up and drop those prices down," he said. "The real vision is to democratize access to space. And the price point is a part of that. We need to get those price points down. Space is expensive. You need to do what you need to do, but I think we'll drive them down."